For more information, see S.O.A.P.S. One of the more confusing distinctions for history students at every level is that between “primary” and “secondary” sources. For your research paper you must include at least one primary source in your references. Primary sources are original, first-hand accounts of an event or time period. They are usually written or made during or close to the event or time period. They can be anything from newspapers or government documents to original, creative writing or works of art. Most importantly, these sources are factual and not interpretive because they come directly from the source. Secondary sources, on the other hand, analyze and interpret primary sources. They are second-hand accounts of an historical event or time period. Most of the historical materials you have seen at this point in your academic career are secondary sources. Below is a table that shows some of the most common primary and secondary sources to help guide your research. The differences between primary and secondary sources is that primary source is when you were a witness to the event that happened. And that you can tell some one of what you saw. Primary sources means first or original. The primary sources are usually from a first person point a view. Some examples are dairies and photos. 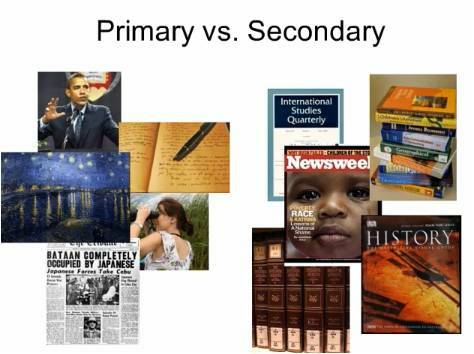 Secondary sources are when you are second or next. It means that the person was not there. There getting information from someone else. These sources are from second or first point of view. Some examples are Google and Wikipedia.